Source: RIA Novosti, November 6, 2017. The Russian state news agency RIA Novosti quoted a high-ranking Russian lawmaker as saying that Japan violated international post-WWII agreements by purchasing weapons from the United States and enhancing the capabilities of its forces to effectively target missiles fired by North Korea. On November 6, U.S. President Donald Trump and Japanese Prime Minister Shinzo Abe announced plans by Tokyo to purchase U.S. weapons and to coordinate military actions against North Korea. 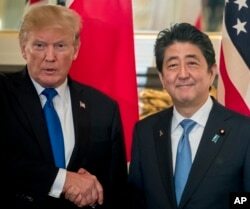 Trump, who met with Abe in Japan as part of his tour of Asia, stated that Japan would be able to “shoot out of the sky” missiles fired by North Korea over Japan if it bought the U.S. weapons. President Trump and Prime Minister Abe at a meeting at the Akasaka Palace, Tokyo, November 6, 2017. The U.S. weapons systems may include missile interceptors, fighter jets, and AEGIS anti-missile defense systems. Japan’s proposed 2018 budget includes some of these systems. The statements come amid heightened concern over a possible military confrontation in the region in light of Pyongyang’s repeated nuclear weapons and ballistic missile tests in contravention of UN Security Council resolutions, as well as its much criticized August 29 test-launch of a missile over Japan. Tokyo, along with its allies, condemned the launch but did not attempt to shoot down the missile for political and technical reasons, which Polygraph.info examined in a separate fact-check. Polygraph.info found no domestic legislation or international agreements prohibiting Japan from purchasing weapons overseas. Japan has over many years purchased weapons from the United States and maintained a substantial and highly capable force for self-defense. Over the last 10 years, Japan has imported over $4 billion in weapons, more than half of them military aircraft, with the United States supplying 93% of the total imports. The Japanese SDF staged a drill using PAC-3 surface to air missile, U.S. Yokota Air Base, Japan, August 29, 2017. At the heart of the debate and Klintsevich’s claim is Article 9 of Japan’s pacifist constitution, which some experts say denies Japan the right to maintain armed forces and wage war. Other experts, however, argue that Japan has only renounced the right to wage war or use/threaten to use force as a means of settling international disputes, as well as the right to maintain a military to pursue this objective. The constitution was adopted in 1947, following the end of WWII, and sought to deprive Japan of the ability to wage war, given its legacy of imperialism and militarism. It banned Japan from maintaining military forces but allowed it to have self-defense forces, albeit with substantial restrictions on their use. Thus Japan has, for decades, maintained what it termed “Self-Defense Forces” (SDFs) to distinguish them from a regular military. 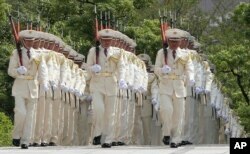 Honor guard members march during a preparation for review by Prime Minister Abe, September 12, 2016. Abe and his supporters have pushed for a repeal of the Article 9 to solidify the self-defense posture and remove various restrictions on SDFs in light of changes in Japan’s geopolitical environment. However, they have succeeded only in revising the defense policy by accentuating Japan’s right to individual and collective self-defense. According to a Library of Congress report, a majority of scholars and government officials recognize that the article does not restrict Japan’s right to defend itself or amass forces to do so. They argue that such forces constitute a “defense potential,” not a “war potential,” with the intent not to wage war but to defend Japan and its allies. The debate surrounding Article 9 intensified recently due to the increased regional threats emanating from North Korea’s nuclear and ballistic weapons program, as well China’s growing military might. 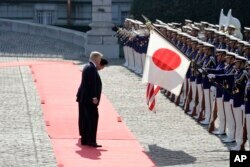 The perception of a U.S. retreat from its traditional global leadership role has sharpened the debate, with Japan taking on a growing global and regional security role. 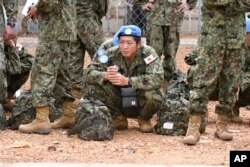 Despite major restrictions, Japan’s SDFs have assisted allied and international efforts in Afghanistan, Iraq, South Sudan, and a host of other countries by providing humanitarian relief and logistics support. SDF wait to board the plane as they start leaving South Sudan, April 17 2017. President Trump and Prime Minister Abe in front of an honor guard, Tokyo, November 6, 2017. ​The Russian government’s position is that the increased militarization of Asia amid tensions over North Korea risks sparking a regional armed conflict that would undermine the regional stability and Russian security. Russia is also concerned about the growing U.S. military engagement with allies in Asia-Pacific, including as it relates to U.S. global anti-missile defense initiatives resting on regional allied system components. As a country that fought Japan twice in the 20th century, Russia has traditionally opposed a strong regional military role by Japan and considered the U.S.-Japanese alliance as a geopolitical challenge.